This entry was posted on Tuesday, February 12th, 2019 at 11:49 am. 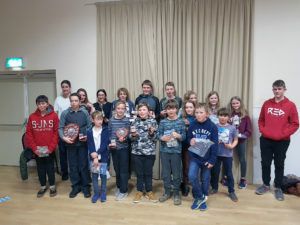 West Wiltshire Youth Sailing Association members at their AGM in January. WEST Wiltshire Youth Sailing Association (WWYSA) is gearing up for a new season after moving onto their new site, and is asking for funding support. The club has moved from its previous site to make way for up to 300 new homes being built by developers Linden Homes, relocating to the other side of the sailing lake. The developers have provided the club with a concrete base to build a new clubhouse, however, the club now need to fund the project. The club said, “Last Wednesday we vacated our old site and have now started to develop the new site opposite the station. This was handed over to us from Linden Homes who have facilitated our move and to whom we are very grateful for the standard of site handed over. “We are now in the process of securing funds to build a new clubhouse on the new site and will operate from temporary accommodation in the meantime. “If anyone would like to support this development we have a crowdfunding page with BT MyDonate at https://mydonate.bt.com/ charities/wwysa. “For those interested in the old clubhouse, an old railway signal box originally – this was taken apart carefully and now sits at the end of the garden of a true rail enthusiast, Maurice Flanaghan in Dilton Marsh, who intends to use it as an office. “We are now gearing up for our new season, which starts on April 1st, and hope to see further changes lakeside by then as our clubhouse begins to take shape. “Thank you to all our volunteers for their continued support, without which we could not operate. Having been going for 50 years purely with volunteer help proves our strength, let’s keep building on this.